Tonsils and adenoids are collections of lymphoid tissue found in the throat. The tonsils are located on each side of the throat in the soft palate. The adenoids are located behind the nose and above the soft palate and generally cannot be seen without the aid of special mirrors to examine these areas. Both tonsils and adenoids function to filter bacteria and viruses entering through the nose or throat. What are tonsillitis and pharyngitis? Tonsillitis is an infection of the tonsils. Pharyngitis is an infection of the back of the throat (known as the pharynx). These two infections may often occur at the same time. Symptoms of tonsillitis of pharyngitis are fever (usually greater than 101º F or 38º C), chills, sore throat and pain on swallowing. There are two basic reasons that otolaryngologists recommend tonsil and adenoid surgery (T&A). These are infection and obstruction. The infectious indications should include chronicity or recurrence as support of these subcategories. The infections may include the ears, nose, nasopharynx, adenoids, sinuses, pharynx, tonsils, peritonsillar tissues and/or the cervical lymph nodes. Obstructions may involve the nasal or oral airways as well as swallowing difficulties. What are the symptoms associated with enlarged tonsils and adenoids? Children with enlarged adenoids may complain of difficulty breathing through the nose or be chronic “mouth breathers”. Noisy breathing with “snoring” quality may be present in awake or sleeping children. Pauses in breathing while sleeping are also seen with enlarged tonsils and adenoids and this is called apnea. Sleep apnea may be a serious medical condition. Ninety percent of all T&A’s are performed on children under 15 years old. Tonsillectomy alone is rarely done in children less than three years old. Adenoids are less frequently removed in adults. Decrease the frequency and severity of ear, nose, or throat illnesses. Reduce obstruction in breathing which may improve sleep, growth, and attention span while reducing problems with bed-wetting. 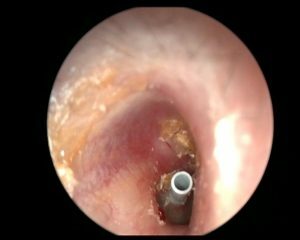 Improve hearing if ear infections were problematic. Removal of tonsils and adenoids is not associated with increased infections due to the relative inactivity of infected tonsillar and adenoid tissue, as well as the presence of vast amounts of similar tissue left in the body after the procedure, such as lymph nodes. What are the risks of Tonsil and Adenoid Surgery? Tonsillectomy is performed under a general anesthetic, and there always is small risk of complications from the anesthesia. The major complication associated with the tonsillectomy/adenoidectomy itself is bleeding at the site where the tonsils/adenoids were removed. This can occur right after the operation or up to seven to ten days afterwards when the eschar covering the operative site falls off. Approximately 1-2% of patients who undergo tonsillectomy/adenoidectomy will have bleeding severe enough to require a trip to the emergency room. About on-half of these people will need to go back to the operating room to control the bleeding, and the other half will stop bleeding on their own. Other rare risks of tonsillectomy/adenoidectomy include infection, delayed healing or abnormal scarring. Dehydration may occur if fluid intake is not maintained at an adequate level. Follow instructions from anesthesia/day surgery personnel regarding eating or drinking prior to surgery and time to come to day surgery for your procedure. Avoid use of over the counter medications. all over the counter nose sprays. ASPIRIN and all aspirin containing drugs. Sore throat for 1 to 14 days. Elevated temperature for 24 to 48 hours. For the first 24 hours avoid milk products as they thicken you secretions. To help avoid nausea do not take pain medication on an empty stomach (with the exception of Tylenol). Use an ice collar for discomfort or small amount of bleeding. Use regular chewing gum 1/2 hour before meals to stretch throat muscles and make swallowing easier. Adequate fluid intake will prevent temperature elevation. Resume regular diet as soon as possible. Avoid “babying” throat. May use a mild laxative after the first day, if necessary. The sooner the throat is used, the sooner the earache will be relieved. Use the throat for talking, swallowing and chewing. It reduces soreness. Return to work or school after seven days if no difficulties arise. No play on playground or Physical Education for 14 days. On the fourth day, you need to begin eating crusty foods such as crackers, potato chips, pizza, etc. to “rough” the back of the throat and promote healing. More than likely you will have a foul odor to your breath 3-5 days past surgery. You can gargle with mouthwash or take 1-2 teaspoons of fruit flavored yogurt in your mouth and let it dissolve. Do not take aspirin or any medication with aspirin. Patients on blood thinners (Coumadin, Aspirin, Plavix, etc.) should discuss this with the doctor. Temperature above 101 degrees, although mild fever is not uncommon in the first 4 days after surgery. Bright red bleeding. The greatest danger period is day 4 through 9 when the white crust comes off. If slight bleeding occurs, put on an ice collar and put the patient to bed. Seek medical treatment if bleeding continues. The patient will be checked by his or her doctor in 1-4 weeks. If you have any question, please call or go directly to the emergency room. The inability to treat this illness on time causes permanent hearing loss, middle ear infections. The resulting hearing loss can have a negative impact on speech and mental development and school success, especially in children. Myringotomy and tube placement is a common procedure performed in children. 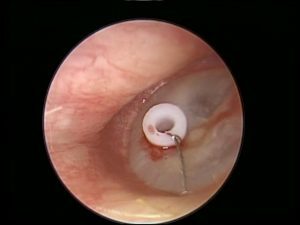 The reasons for ventilation tube insertion include: 1) fluid is present in the middle ear cleft for greater than 8-12 weeks despite adequate medical therapy causing a significant hearing impairment, 2) recurrent ear infections are debilitating secondary to severity or frequency, 3) severe retraction makes the ear likely to develop adhesions, cholesteatoma, or other chronic ear problems such as vertigo, tinnitus, and/or speech and language delays, 4)eustachian tube dysfunction with intermittent ear complaints. Follow instructions from anesthesia/ day surgery personnel regarding eating or drinking prior to surgery, and time to come to day surgery for your procedure. Surgery for myringotomy and tube insertion is usually performed under general anesthesia with a mask ventilation technique. There is normally no need for an IV (intravenous line) and the whole procedure is less than 20-30 minutes in length. Any fluid is aspirated, and appropriate cultures are performed when necessary. Eardrops are commonly prescribed in the post operative period. Mild pain in the ear and neck. Drainage from the ear for 48 hours. Avoid getting water in the ear. Be very careful while bathing. You can coat a cotton ball completely around with Vaseline and place in your ear in order to make a good seal while bathing. No Swimming!! After you return to the office for your post-operative check-up we will discuss ear plug options with you if you plan to go swimming. If you have been prescribed an antibiotic (not everyone requires this), please take it according to the directions on the bottle and complete the amount given to you, even if you feel better before the medication is finished. You may resume normal activity level one day after surgery excluding getting ears wet. A follow-up appointment will be made for two weeks following surgery. After that visit, an appointment for two to ten weeks later for a hearing and pressure test may be necessary.